The holidays are over, it’s a new year, and that means any rider deals that ran through the end of the year are now up. It also means teams are beginning to reveal their rider rosters for 2018. The following is our unofficial work-in-progress list of teams compiled based on official PR, rider social media posts, and the word on the street. So if you know where a particular rider has landed in 2018, please drop us a line via our Contact page and fill us in on the details. 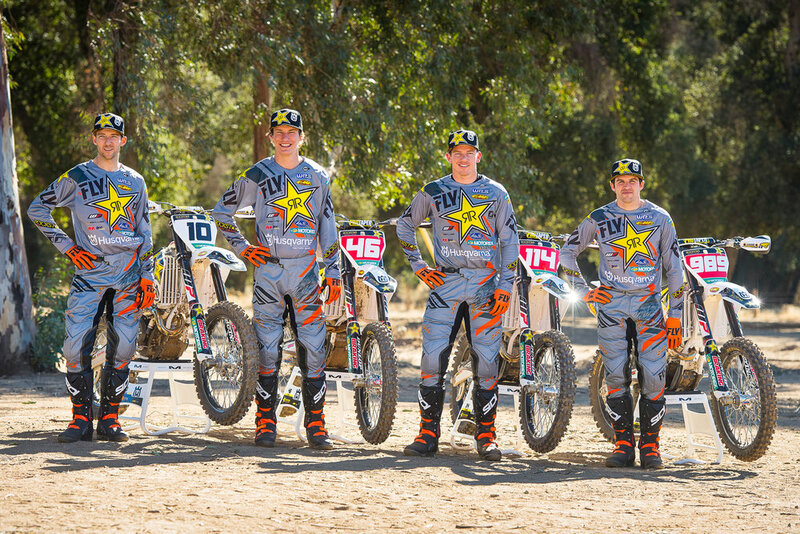 Rockstar Husqvarna returns with Colton Haaker, Josh Strang, and Thad Duvall and adds Dalton Shirey (46) on the west coast. Photo: Husqvarna/Simon Cudby. 2017 Hare and Hound and WORCS champion Gary Sutherlin will race a Suzuki in 2018 after being dropped by the Purvines team. Photo: Kris Keefer. After a strong 2017 season Evan Smith landed a spot on the SRT/Husqvarna team for 2018. Big 6 Champ Zach Bell moves to the 3 Bros. STI Husqvarna team for 2018. Ty Tremaine may be the first factory-backed electric bike offroad racer after signing with Alta. Photo: Alta Motors. Brendan Riordan will ride a YZ 250 FX in GNCC XC2.